The book starts out with Connor (Superboy) and Cassie (Wonder Girl) on their first date. Suddenly, Connor is pulled into a vortex, leaving Cassie confused. Within moments, Connor returns but is slightly older. He has been to the 31st Century and has come back to get the help of the Titans. This group of comics concerns the future of the Titans - both as a group and as individuals. In the 31st Century, they are instrumental in negating the threat they were brought back to prevent. But on their return trip home, they arrive ten years in their future to find that they are not even close to the people they would have expected to be. Between coming to terms with that and trying to decide how to prevent it from happening, the Titans have a lot to think about. I enjoyed this portion of the Teen Titans series, but then again, I always like time travel stories. The book is a good way to continue to get to know these newer Titans. Having read some of the future books, I know some of the changes that will be coming over the team and it's interesting to see how these changes are set up in the earlier books. 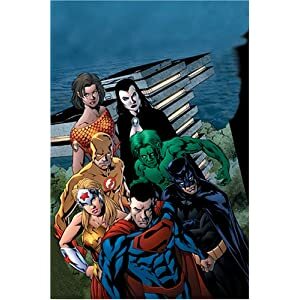 As with most of the other Graphic Novels that I've been reading, I think that if you enjoy reading Super Heroes, you really can't go wrong with Teen Titans. And this is definitely one of the better stories lines out there.